Buy 14 or more for $20.89 each. Can you enjoy more of what life has to offer? 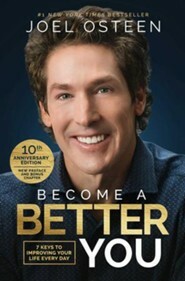 Bestselling author and Pastor Joel Osteen suggests you must discover the potential within yourself and learn how to use it to live better, and to help others better themselves as well. God didn't create you to be average. You were created to excel and you have everything you need to fulfill your God-given destiny, and there is no limit to what you can accomplish if you discover how to be a better you. This audio will guide you in the process of uncovering your hidden resources by addressing such topics as building your confidence, developing better relationships, finding peace within, and staying passionate about life. You will be encouraged to reach your unique God-given potential, and enjoy every day of your life, despite your circumstances. As you incorporate Joels easy-to-grasp principles into your life, you will be pleasantly surprised at how much more God has in store for you, and how quickly you become a better you! Abridged. 5 CDs. 6 hours. Read by the author. 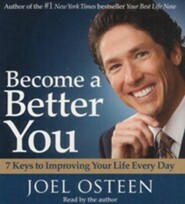 I'm the author/artist and I want to review Become a Better You: 7 Keys to Improving Your Life Every Day Audiobook on CD.